My daughter Mykensie had fallen in love with my mom and dad's dog and was upset for weeks, she wanted a cream or apricot dog that looked just like Coco. After a long wait, Bev gave us Carmen. A beautiful little champagne and tan girl. She has the most beautiful big dark eyes and would sit in your lap for hours. She was the baby, and now she is definitely the princess. Mykensie and Carmen instantly bonded, Mykensie taught her how to walk on a lead, and then on a show lead. We laughed because Carmen walked better in the ring for Mykensie than anyone, so a few handler lessons later and Mykensie became Carmen's handler. Heather put 8 of Carmen's champion points on quickly, and then Mykensie got to finish her. We had another champion. 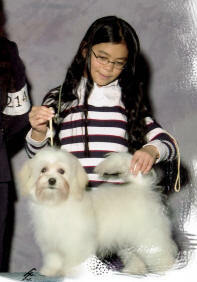 Mykensie also got her confidence with Carmen and started doing Junior Handling. She took a first, then another first, then another ... there is no stopping her now!!!!. Check out Mykensie's Junior page. Carmen gave us beautiful puppies this year. Check out her pups under the Puppy link - previous litters.